Selling 225,000 tickets in the space of a little more than an hour is a remarkable achievement, but I’m not convinced that the frenzied reaction to The Stone Roses’ reunion gigs at Manchester’s Heaton Park next June is an indication of what an important band they are. I think it probably says more about how, from their mid-30s onwards, most people wish they were several years younger than they are and get a bit woozy at the prospect of an evening re-living their past, which is something that music can help them to do more quickly and more completely than anything else. Adam Ant talked about The Stone Roses when he appeared on last week’s “This Week”, BBC2’s zany political overview programme. Adam’s on the comeback trail himself (starting his forthcoming tour with a warm-up show in Frome, just down the road from me) and pointed out that what people want to hear at reunion gigs are the hits. He’s dead right, of course. 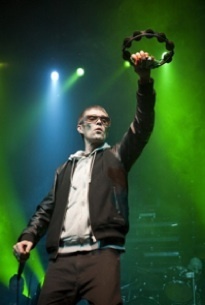 So if I had one of those tickets for Heaton Park I’d be concerned at the news that, as well as playing live again, Ian Brown says the Roses are planning to record a new album. Let’s face it, most of the fine folk going along to Heaton Park won’t want to hear much stuff from the second album, let alone stuff from a possible third. I’d also be worried about the group spending a few months locked down in the recording studio, with all the potential conflict that might bring. There’s time for quite a lot of arguing and falling out between now and next June. In all the media hoo-ha about The Stone Roses in recent days, I especially enjoyed a piece by The Independent on Sunday football correspondent Steve Tongue, who picked up on something bassist Mani said on Sky’s “Soccer AM” in 2006. Mani, a diehard Manchester United supporter, had joked that the band would only reform “after Man City won the European Cup”. Manchester City were flirting with relegation from the Premiership back then and finished that season losing nine of their last 10 games. Fast forward to today and City are sitting on top of the table, fresh from thrashing Manchester United 6-1 on Sunday, and pushing for a place in the last 16 of the UEFA European Champions League. I don’t suppose Mani will be best pleased if City were to make it all the way to the Champions League final. And as Steve Tongue notes, the final takes place on 19 May, a mere six weeks before The Stone Roses’ Heaton Park gigs. someone the other day mentioned in the windmill in brixton interesting cover/tribute bands, theres one band making a “career” of a guided by voices act! then another person mentioned about rockbitch! the daily mail would love that! A third Roses album? Don’t be daft. It took them five flipping years to come up with the second. Think they’re going to knock one out before next summer? Don’t be daft. Might get a single at best. I’m not sure how many people who’ve bought tickets were actually around first time. Deosn’t really matter, but if they had seen The Roses back in their day they would know they were worse than awful live. Why anyone would put themselves through that again willingly is beyond my pea brain. That said, they are hugely entertaining as people, good luck to them whatever happens.